Employees need to know and trust their leaders to feel truly engaged at work. The Leadership Corner brings together all the important and interesting things the people at the top are thinking, saying, and doing – both inside and outside the organization. It’s a space to tell their stories and clarify their priorities, while inviting feedback from employees at all levels. It’s easy for employees to stay plugged-in to the leadership team’s vision when there’s one place to follow their social media presence, business presentations, and media appearances. Putting a human face on the leadership team builds loyalty in employees. 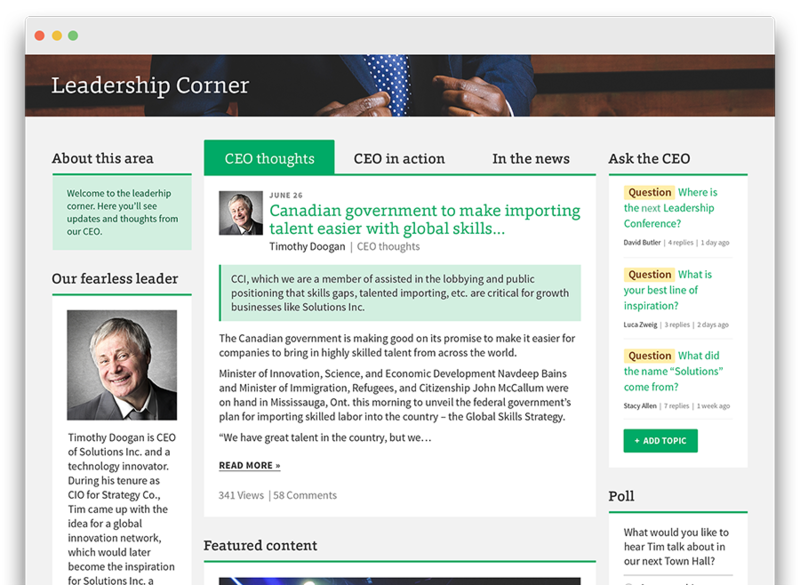 Bios and blogs allow people to get to know their leaders and understand what they’re doing for the company. When people have a question or comment about something they’ve seen, they can tap into channels for direct interaction with the leadership team.